Over the past year, as I planned my trip around the US, I enjoyed imagining myself as a sort of *Kokopelli on what I termed my #loveandworktour. *Many believe that Kokopelli was more than a trader, and more significantly, an important conveyor of information and trinkets from afar. As a Story Teller, par excellence, Kokopelli had the gift of languages with a formidable repertoire of body language storytelling skills to complement his many talents. I imagined that I would visit friends and family, offering to trade my services for a bed. 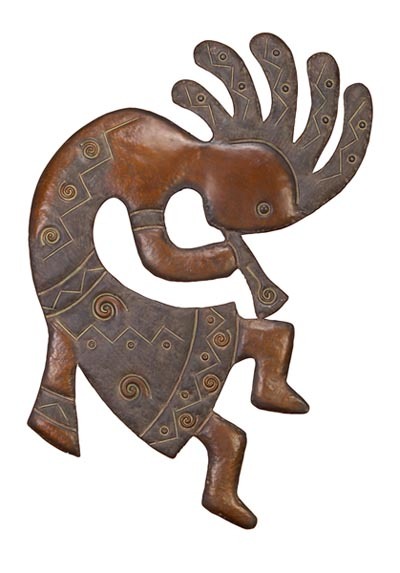 Like Kokopelli, I would bring stories, and trinkets. After all, as an actor and writer, I too have a gift of languages and body language storytelling skills. I even have a backpack, so I can look the part. So far, nearly everywhere I go, my hosts say to me, “We used your visit as an excuse to do a good housecleaning.” At my sister’s house in Atlanta, I found hydrangeas on the nightstand, and sat with her on the shady back porch where we watched hummingbirds cluster around the feeder. My brother and sister-in-law in Kentucky made me biscuits and gravy, and showed me treasures they’d picked up at estate auctions. My friend Michael in Oklahoma City took me to Myriad Park. “You’re the first person I get to take around to see the sites,” he says, as we pass by fountains with squealing kids, and catch up on news. I had not seen Michael since 1989. In the intervening years, we’ve both married and divorced, and racked up credibility in the world of film and theater. I pulled into the driveway in Tulsa, where my friend DeLana (who I’d not seen since we graduated high school) stood on the porch to greet me. “I’d have recognized you anywhere,” we said as we hugged, the years falling away like magic. All across the country, my friends and I delight in our similarities and track the changes wrought by the years. We’ve been taking photos and videos for Facebook, and it’s an online love fest we are sharing with our friends. That I am having such a good time with these quality people does not surprise me. We’re lifelong friends for a reason after all. But I hadn’t realized how much I would enjoy the simple act of appreciating others. A week or so into my trip, as I dropped my backpack in yet another comfy bedroom on my journey and settled into the lovingly made bed, it occurred to me that I am using my skills in an unexpected way. As an acting/writing coach, my job includes listening and assessing, and that’s what I’m doing as I listen to my friends and family on this trip. I’m using those skills in the act of “appreciating” them. Of course, as this idea came to me, I pulled out the dictionary to research the word “appreciate,” which means “to recognize the full worth of”. And that’s exactly what I’m doing – happily recognizing the full worth of my friends and family, and they’re grateful to have their full worth recognized. I realize that it is typical to lose sight of the full worth of the people in our inner circles. We get accustomed to them, take them for granted, and they do the same to us. But in my “Kokopelli” aspect, I get to see them with new eyes, and all of their various talents and skills impress and delight me, and I tell them so. It becomes a sort of mutual admiration session, where we get to be new in each other’s eyes. I recall that at one point I felt obliged to volunteer to take on tasks and projects for my friends, to barter my skills and talents (or plain work) for a place to stay. I’m very fortunate that most of them are well content to offer me bed and dinner without recompense–that they are happy for the opportunity to share their homes, and to be appreciated by a visitor and loved one. This is not to say I am not doing anything for them. After we make our way through the joys of the immediate sharing of news and families and successes, we’re also sharing our challenges and troubles. And here again, my fresh eyes are very welcome. I bring my skills and experience to the table, and we are finding that I’m able to offer possible solutions. None of this is surprising – after all, new eyes do bring new ideas. But there’s something about the way it’s happening that is creating in me a new clarity about the meaning of loveandwork. It’s the work that can be done when looking with the eyes of love – and appreciation. My “bag of trinkets” is actually wisdom and skills I’ve gathered through the years, that I can offer to do the “work” of making life better. And the “love” part of the loveandworktour – well, that’s a blessing that we give each other, boundlessly, with joy and appreciation. I love taking this journey with you!